Finding Pictures with Two People – Learn Picasa and Google Photos! 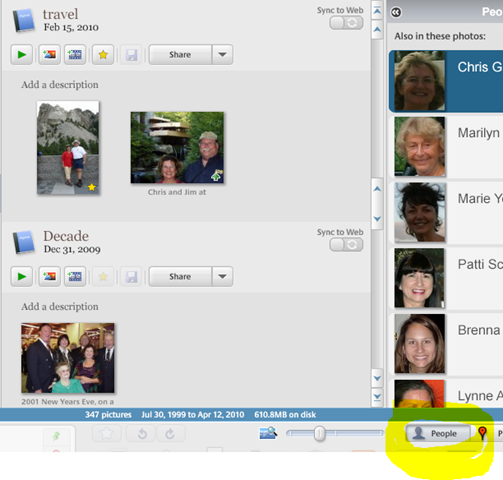 Some people adore the Face Recognition feature in Picasa – just ask anyone researching their family genealogy! Some people find it a nuisance. I fall somewhere in the middle. But, I have found a really good use for it myself and I want to pass that along. Have you ever needed to find a photo of you and your spouse together? I recently did. How long do you think it took me to go thru my 25,000 pictures and find the best one that has both me and Jim in it? 1 hour? 2 hours? Click on the People button in the lower right corner – that opens up the People pane and you will see all the other faces that appear in the selected pictures. In the people pane, click on a picture of me. Now I’m looking at 62 pictures where both Jim and I are in the photo. It’s a pretty easy task to find the best one now. Oh yeah … I like this picture from our travels last summer. Recognize the famous house in the background? 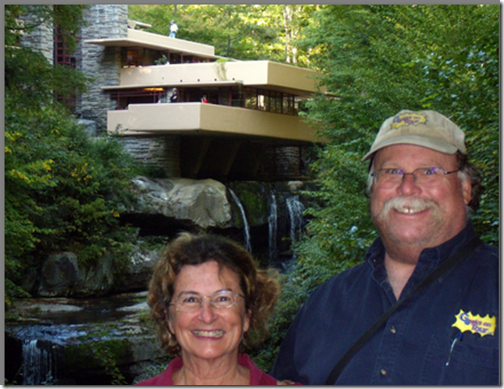 That’s Fallingwater by Frank Lloyd Wright. So a little late to the party – but maybe you wizards know; how do you search for images with JUST the person(s) you are looking for? Example; I want to display all pictures of my sister, but only the pictures where she is alone in the picture. Or, the pictures of my sister and her boyfriend, but only the pictures of them, and noone else. How do you do it in Picasa? This was a lot of help. Thank you. Oh! Thanks so much! I had to looked for pictures with my girlfriend too! For me and my girlfriend, thanks. Great tips – about dupes, and about finding pics with multiple people. Thank you. By the way – I have to say that at first glance, I thought you were wearing one of Philip Treacy’s latest hats!!!!! I just tried it and it really works so well so quickley–Thanks again–Love all your tips–That’s really a good picture of the two of you at Falling Waters. Thanks for an extremely helpful tip. Especially because, try as I might, my pictures are not well organized on Picasa. I often experience duplicate pictures on Picasa (yes, I always check the do not copy duplicates)and I am afraid to delete for fear they will be totally deleted from my hard drive. I am so glad a Picasa teacher in Port Charlotte,Fl told us about your site!